Starring: Dane DeHaan, Cara Delevingne, Clive Own, Rihanna, Ethan Hawke, and more. From the director of ‘Léon: The Professional’, ‘Lucy’ (eyeroll), and maybe most importantly, ‘The Fifth Element’ comes Luc Besson’s pride and joy: His film of ‘Valerian and the City of a Thousand Planets’. With what is expected to be a visual spectacle and a sci-fi adventure film for the ages, what is the overall Oberrating? Well it is time to get that hot take. As expected, Valerian did not disappoint visually. Luc Besson and his crew have created a visually stunning film and it does not go unnoticed. Even in standard format, it was quite beautiful and for once I actually wish I watched it in 3D. Normally I avoid 3D because it gives me a headache and I see no added experience to the format but this film surely makes me think otherwise. From the city/ship of Alpha, to the many races of aliens present in the film, or simply to the weapon warfare and combat. Everything was gorgeous to watch and ultimately satisfying. However, beyond the effects, the rest of the film was a bit lacking when all things are considered. First off, the characters within the film have to go over miles of hurdles before they get to touch the main point of the story. It feels almost like an Oblivion/Fallout video game. You want to do the main mission but end up going on five to sixty side missions before remembering to do the main mission. This may be a personal gripe but regardless, I was not a fan of how the story played out. Writing wise, it was mostly hit and miss for me. A co-worker of mine hit the nail on the head by calling it overall “cheesy”. With a multitude of misfired jokes, contradicting lines delivered from characters, and struggling chemistry, as I previously said, the writing for the film was shoddy and distracting rather than natural and smooth. As for Dane DeHaan and Cara Delevingne, I am at an even split for the two. I enjoy these two very much so and in this film, I genuinely still enjoyed them for what it was worth. While they delivered their given lines as best as they could and acted every moment with all they had, it still felt as if something was missing. I felt unfulfilled by film’s end and mostly came to the conclusion on lacking or shoddy material versus lacking performance. 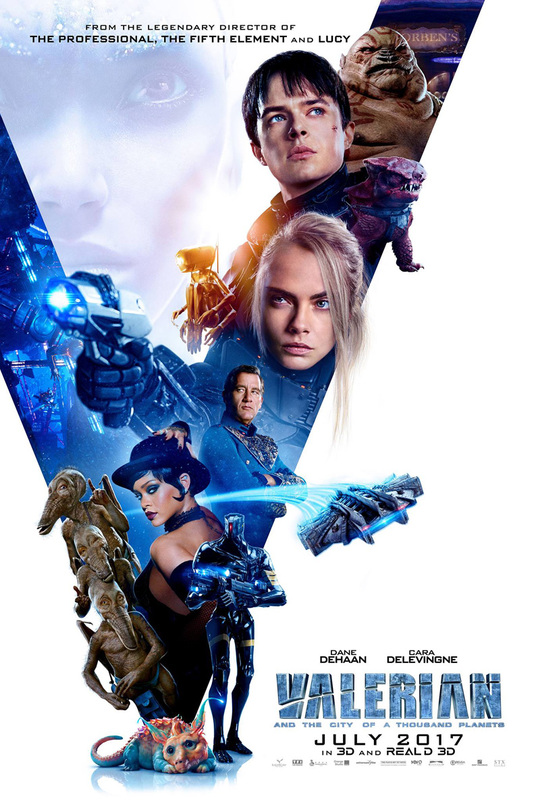 Initially I was teetering on a three or four out of ten for ‘Valerian and the City of a Thousand Planets’. After carefully evaluating my experience with the film, I brought it up to a five. Luc Besson delivers a risk many other directors are afraid to touch. The concepts Luc and his Valerian film deliver are wild and imaginative. It is a fun and visually appealing film despite a questionable approach to delivering the story and having some cringe-worthy dialogue… Okay, maybe a lot of cringe-worth dialogue. Regardless, I bring it to a five with hopes its future films will be improve with time. Luc does not disappoint with his bold approach but the film overall has plenty of negatives along with plenty of positives. Posted in 2017 Movies, Movie Review.Tagged 2017, Dane Dehaan Cara Delevingne, Luc Besson, Movie Blogger, Movie Reviews, Movies, Valerian and the City of a Thousand Planets.